Malaysia’s Armed Forces Chief, General Zulkifeli Mohd Zin, is threatening to unleash the army on civilian demonstrators exercising their constitutional rights this weekend [see attached Malaysiakini news report]. Shame on him for behaving like a member of the ruling party rather than as a professional solider in a democracy. His warning that the armed forces has to be on guard in the event of an incident like the recent bombing in Bangkok is simply ridiculous and indicates just how far this government is willing to go to intimidate its citizens and mislead the public. In any case, he should know that such matters fall under the purview of the police rather than the army and that therefore he has no business getting involved in these matters. Hasn’t he learned anything from history about the disastrous consequences of army intervention in the affairs of a nation? Perhaps he needs to take a trip up north to Bangkok to see for himself what happens when generals get ambitious. He is also taking the armed forces into unchartered territory – the armed forces have, until now, always stayed out of politics. 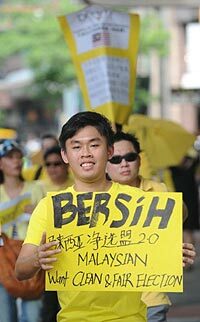 Is this a sign that another that yet another national institution has been corrupted by more than 50 years of UMNO rule. 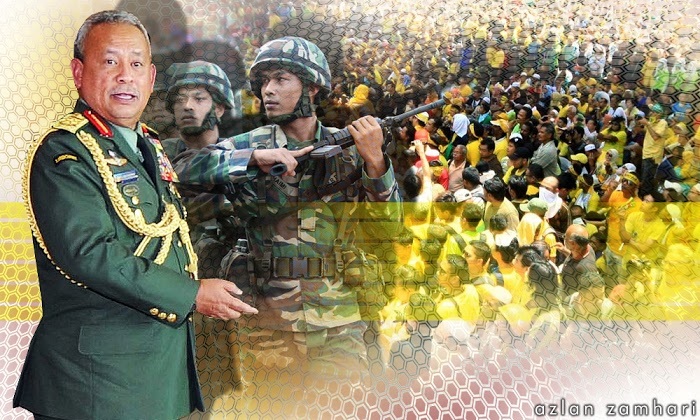 The military will intervene in the Bersih 4 rally this weekend if the government declares a state of emergency, Malaysian Armed Forces chief Gen Zulkifeli Mohd Zin said today. “The Armed Forces will only intervene in the rally if the government declares a state of emergency. “If the situation is categorised as a threat to public order, we will take over the role of the police in containing the situation,” Zulkifeli is quoted as saying by The Star Online. For now, he said, the military will not be deployed for the planned rally on Aug 29 and 30 but he pointed out that they were trained to deal with rallies that get out of hand. “It doesn’t mean we haven’t been carrying out training with the police to maintain public order. “We need to ensure that we are always prepared, skilled and efficient in our duties should the government declare a state of emergency,” he is quoted as saying. Zulkifeli said the Armed Forces had to be ready to take preventive measures to prevent a similar incident to last week’s bombings in Thailand taking place in this country. “We worry if rallies like these turn into states of emergency due to certain reasons. “There are many factors that could turn a rally, however peaceful, chaotic,” he is quoted as saying. Zulkifeli said people may be out to take advantage of the situation.